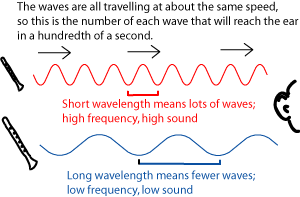 Figure 1: A sound that has a shorter wavelength has a higher frequency and a higher pitch. Notes that are one octave apart are so closely related to each other that musicians give them the same name. A note that is an octave higher or lower than a note named "C natural" will also be named "C natural". A note that is one (or more) octaves higher or lower than an "F sharp" will also be an "F sharp". 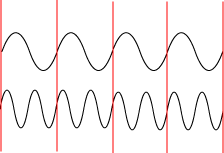 Figure 2: When two notes are one octave apart, one has a frequency exactly two times higher than the other - it has twice as many waves. These waves fit together so well, in the instrument, and in the air, and in your ears, that they sound almost like different versions of the same note. The notes in different octaves are so closely related that when musicians talk about a note, a "G" for example, it often doesn't matter which G they are talking about. We can talk about the "F sharp" in a G major scale without mentioning which octave the scale or the F sharp are in, because the scale is the same in every octave. Because of this, many discussions of music theory don't bother naming octaves. Informally, musicians often speak of "the B on the staff" or the "A above the staff", if it's clear which staff they're talking about. Figure 3: The octaves are named from one C to the next. For example, all the notes in between "one line c" and "two line c" are "one line" notes. Figure 4: Each note is considered to be in the same octave as the C below it. The word "octave" comes from the Latin root meaning "eight". It seems an odd name for a frequency that is two times, not eight times, higher. But it is called an octave because it was named by musicians, not scientists. Octaves aren't the only notes that sound good together. The people in different musical traditions have different ideas about what notes they think sound best together. In the Western musical tradition - which includes most familiar music from Europe and the Americas - the octave is divided up into twelve equally spaced notes. If you play all twelve of these notes within one octave you are playing a chromatic scale. You may be thinking "OK, that's twelve notes; that still has nothing to do with the number eight", but out of those twelve notes, only seven are used in any particular major or minor scale. Add the first note of the next octave, so that you have that a "complete"-sounding scale ("do-re-mi-fa-so-la-si" and then "do" again), and you have the eight notes of the octave . These are the diatonic scales, and they are the basis of most Western music. Now take a look at the piano keyboard. Only seven letter names are used to name notes: A, B, C, D, E, F, and G. The eighth note would, of course, be the next A, beginning the next octave. To name the other notes, the notes on the black piano keys, you have to use a "sharp" or "flat" sign. 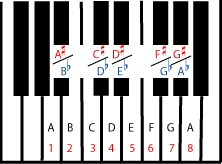 Figure 7: The white keys are the natural notes. Black keys can only be named using sharps or flats. The pattern repeats at the eighth tone of a scale, the octave. 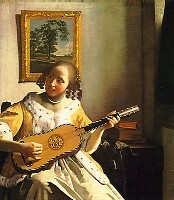 Whether it is a popular song, a classical symphony, or an old folk tune, most of the music that feels comfortable and familiar (to Western listeners) is based on either a major or minor scale. It is tonal music that mostly uses only seven of the notes within an octave: only one of the possible A's (A sharp, A natural, or A flat), one of the possible B's (B sharp, B natural, or B flat), and so on. The other notes in the chromatic scale are (usually) used sparingly to add interest or to (temporarily) change the key in the middle of the music.